As with most cloud technology, there’s more than one option when it comes to servers. The original server type is bare-metal, while a later innovation lead to virtual machine servers. Although a bare-metal server is used, along with a hypervisor, to form the virtual servers there is a common debate as to which server type is preferable. 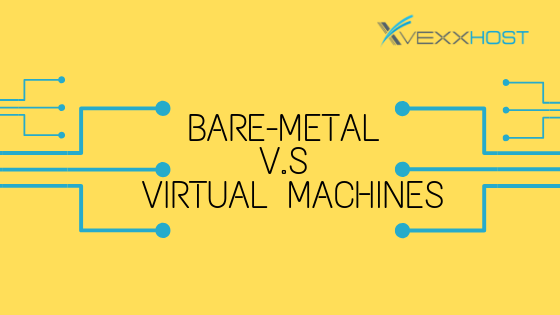 At VEXXHOST, because we offer both bare-metal and virtual machines we’re delving into some of the key differences between the two. You can also check out our previous blog post for more information on vms! One of the significant differences between a bare-metal server and a virtual machine server is the level of dedication that exists with clients. A bare-metal server is a physical server that is dedicated to a single customer, meaning that they aren’t shared between tenants. Virtual machine servers, on the other hand, can be shared among multiple tenants through the hypervisor which can create multiple operating system instances and, as a result, numerous isolated virtual server envrionments. When comparing pricing, the first thing that should be noted is that the billing differs between bare-metal and virtual machine servers. For bare-metal servers, the customer is billed a consistent amount on a monthly basis for the hosting, while virtual machine servers follow a predetermined billing period and only cost the customer for the resources used. Secondly, bare-metal servers are traditionally more expensive than virtual ones, however, this can be dependent on whether they’re being used for enterprise-grade workloads over a sustained period of time. In the realm of performance, there is no argument as to whether or not bare-metal servers can harness more processing power than virtual servers although the margin may not be as noticeable as expected. With virtual machine servers, on the other hand, they have the ability to scale up and down, as needed, almost instantly. The primary difference between the security of bare-metal servers and virtual servers is their tenancy. As mentioned previously, bare-metal servers are single-tenant while virtual machine servers are multi-tenant. Through this aspect alone, bare-metal servers are considered more secure and private. As with most cloud technologies, there isn’t necessarily only one right solution, it largely depends on your needs. For example, a company in the financial industry would benefit from a bare-metal server due to their consistent enterprise-grade workloads and security requirements. Contrastingly, a retailer may be better suited for virtual machine servers to manage fluctuating traffic and control costs. Put VEXXHOST’s experience in consulting to work for you in ensuring your cloud infrastructure is optimized to meet your needs – contact us today!